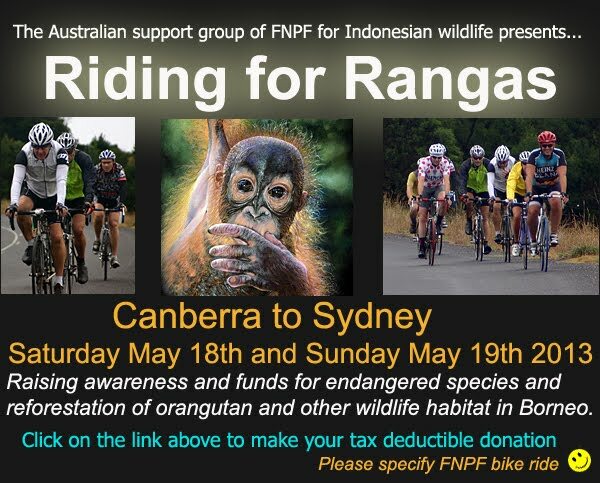 On the weekend of May 18 and 19, 2013, 11 Sydney cyclists will be tackling a challenging course from Canberra to Sydney to raise funds for the Friends of the National Parks Foundation (FNPF), an Indonesian not-for-profit community-based conservation organization that respects the interdependence of wildlife, habitat and local community. In its forth year, the 330km ride has raised thousands of dollars towards helping to save threatened species including Orang Utans, the Cloud Leopard and Bali’s national emblem, the Bali Starling. Deforestation, illegal logging and uncontrollable fires have largely destroyed much of the orangutan habitat. Over 80% of their habitat has been destroyed over the past two decades. More than 3,000 orangutans are killed each year, and only, 40,000 orangutans remain in the wild. Friends of the National Parks Foundation has won numerous awards including the 2012 World Rainforest Award. It has been supported by the Humane Society International Australia since 2000.